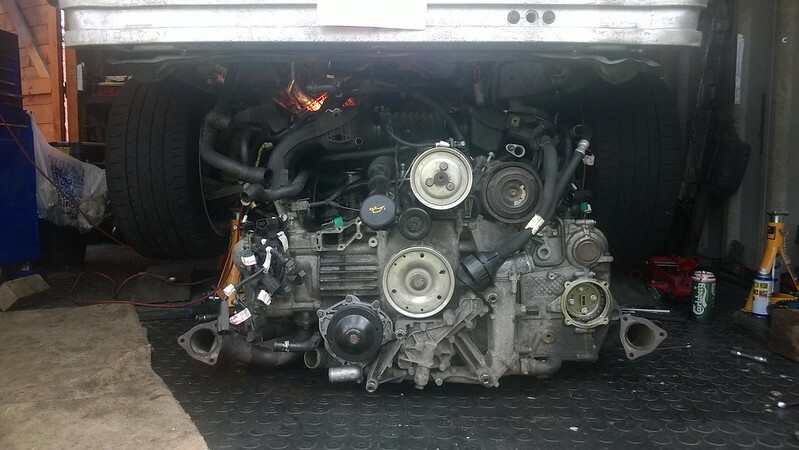 911uk.com - Porsche Forum : View topic - DIY Engine removal - some questions......... and answers. 911uk.com Forum Index > 996 (1997 - 2005) > DIY Engine removal - some questions......... and answers. 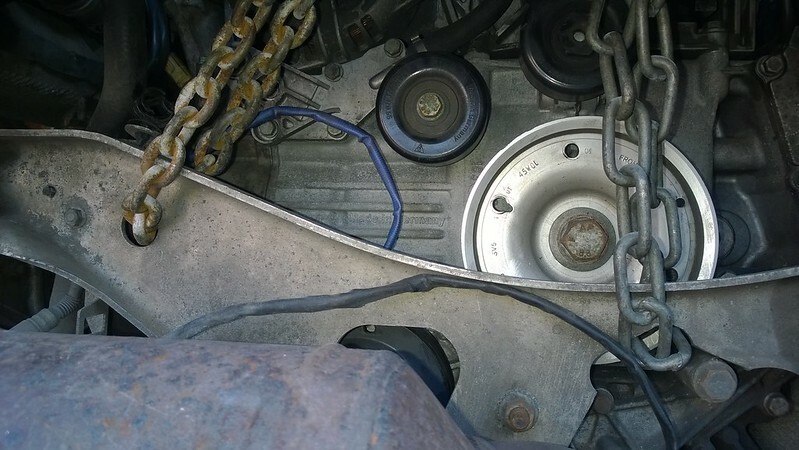 Posted: Sun Mar 04, 2018 7:03 pm Post subject: DIY Engine removal - some questions......... and answers. I appreciate there are some variables, but.......From the extensive experience of some of the accomplished mechanics here. 1.) How high off the ground do you need to lift a 996 coupe, to be able to pull the engine and transmission out from underneath? 2.) 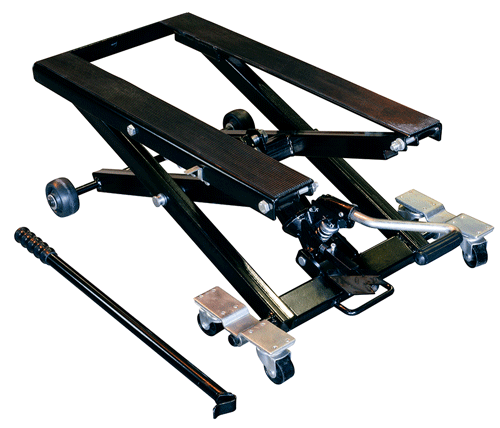 Also, thinking of using a wheeled hydraulic motorcycle lift, (with a collapsed height of 110mm and 400mm fully extended.) Is this feasible do you reckon? The height of the engine complete with ancillaries such as the plenum I've measured as 650mm. At the moment, it appears I may have to drop the engine, then remove the inlet plenum and runners before moving the engine back out of the car. We use something like this at work .. This sort of thing is used with a ramp though , you could never jack a car high enough to use this sort of thing . For height then look at the top of the engine , the body has to clear that so on the ground you can already see how high it needs to go .. add in the trolly base height and its higher . on a ramp then i work underneath to undo the main fixings .. im on my knees but basically waist height .. you then raise the car or lower the trolly .. if you dont raise the car then you cant see if any cables are catching . I see what you are saying .. 650 + 110 so 760 mm . Ive sat here with a tape measure seeing how high that it ..
Its pretty high for axle stands . If you can find axle stands that high then a corner jack and raiseing the car a bit at a time might work .. but the car wont be that stable at that height on just stands .. my worry is it could fall . I take it theres no type of sissor lift that could be used to get the car high enough ? That's the theory, but just wondered about others practical experience. Ah, just read your second post. Yes jacking posts are around 14cm off the ground. so axle stands need to be 52cm tall. A slight nose down lift will raise the rear bumper another slight amount. I drop my engine down onto a low wooden trolley on little wheels I made, I use my engine crane and drop it through the engine opening, with the engine lid removed obviously with a trolley jack on the gearbox. I also sometimes remove the inlet manifolds in advance of pulling it out from under the car as it give more clearance but if you don't need to remove the inlets for the work you are doing just get the car high enough. Unsure what exact height I have the car but I have the front wheels on metal ramps, for extra height and stability and the rear end on axle stands as high as I can jack the car but this will give you an idea of how high I get mine. 52 cm seems a little low , that guide from Wasz says 72 cm .. on a flat surface . Closest person to me as well ! Ok so a flat sruface and the car is pretty high on axle stands .. engine removal ok .. refitting and you would have to be carefull . Its hard to explain but the engine will locate ok but the gearbox often hangs down .. if you have a seperate jack then you can raise it but you are almost lifting the car . On a ramp thats not a problem but on axle stands its a bit iffy . Yes it seems to be possible but as im always banging on about safety then you need to be carefull . Not an accomplshed mechanic but we've had a turbo engine and box in and out several times this summer for various reasons. My £0.02 - I'd look into renting the use of a ramp from somewhere if at all possible. I use the front ramps for safety reasons, it adds stability to the car when moving things around, I have each ramp facing different directions so the stop point is against a tyre in opposite directions. I also put a piece of wood between the drivers seat and the brake pedal, this keeps the brakes on the front wheels to again stop any movement. I have removed my engine probably 5 times now off axle stands and front ramps each time, never had an issue but do check everything is stable before commencing. Also using an engine crane makes life easier, you are more in control of the drop. You are totally correct to question it and it's safe if your are methodical and double check everything, I have a good system in place for everything now. But I would hate for someone to get hurt by something slipping. Wasz - Thanks for the link, I'll have a good read of that. She appears to have taken off the inlets as well as removing the blocks of wood. I have looked at that type of ATV / Motorcycle lift. Its cheaper, but only lifts 27cm and needs to be used with another jack as per the picture..
Demort - I like being called a young man it hasn't happened in a while. I promise that when you come over it will be to drink tea and eat biscuits not work on my car!!! Infrasilver/Jay are / Demort - Definitely hearing you regarding safety. Makes my toes curl to think what I have done in the past and gotten away with....... no more, hence seeking you guys advice. Infrasilver - I have an engine crane, that might be the answer.... presuming you put a strop around the cylinder heads and lift on that? I have a metal framed crawler which I've used in the past to drop an engine and box out of the bottom of my old Fiat X1/9. I use the rear mount on the engine, it holds the engine onto the engine mounts so is easily strong enough and there is no chance of damaging anything on the engine when the chain or strap gets tight. Just put a rag for protection on your engine bay paintwork as it may scratch it when I gets taught. There is a bit of weight bias to the left side of the engine so I use two chains, middle one to lift, left one to keep it stable. Left chain is attached to the middle chain. I just searched for a picture and luckily I have one. I may use the crane to hold the engine while re configuring the ATV lift mid drop, or just use the crane. Saves buying anything special, just a bit of woodwork, and some sturdier axle stands than I currently own. Leaving the front wheels on and putting them on a ramp would allow movement there rather than sideloading the axle stands when jacking the car as well. Also using a separate jack on the gearbox will allow for wiggle as per Demort's earlier comment. Some really useful advice here. I am also thinking of attempting an engine drop - as I have a few jobs that look pretty inaccesible. I also fancy learning how to do this on the 911 (used to be able to get the engine in and out of my mini when I was younger). I have treated myself to a low-rise scissor lift, which is brilliant. Good luck with this, some sound advice. May be some pictures and a thread on height and how the car is safely supported, and tools used?